With Photoshop Touch, you can use your Apple tablet to produce and edit images, combine images, apply effects, work in layers, extract parts of an image, and refine work created on the tablet with your desktop Photoshop program. Photoshop Touch also has a social networking component that lets you share your work with Facebook friends and view their comments. Introduced last fall as part of the company's mobile app initiative, and thus far available only for the Android OS, Photoshop Touch is the second of six Touch apps to be made available for iOS devices. Of the other apps—Proto, Ideas, Debut, Collage, and Kuler—only Adobe Ideas, a vector drawing and sketchbook app, has thus far been available for iOS. Targeted to creative folk and Photoshop users of all levels, Adobe Photoshop Touch lets you create or work with images on-the-go. Just tap the screen with your finger or a stylus, and a host of familiar, Photoshop tools—such as Paint, Clone, and Eraser—become available. The app works with images of up to 1600 by 1600 pixels in dimension. It offers sophisticated functionality such as working with layers and live-camera fill layers, blend modes, fades, and Photoshop-style methods of selecting, integrating, and separating images. Selection can be tricky no matter how or where you do it, but Photoshop Touch's Scribble function, alongside more familiar selection choices such as the Marquee and Lasso tools, lets you select with a fingertip the parts of an image you want to keep or discard. 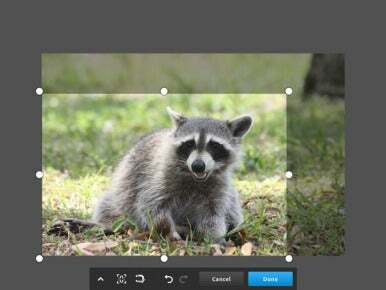 Refine Edge, another Photoshop-derived selection feature, also makes an appearance on Photoshop Touch to assist with difficult selections like hair, grass, and fur. Photoshop would not be Photoshop—even in Touch form—if it did not include a library of special effects and filters, which you can apply to parts of an image, layer, or selection. Using a finger tap, you can move between different sets of effects and easily apply them. The Filter Brush feature lets you paint effects onto your image with your fingertip. Either by layer or selection, you can also apply tone and color curve adjustments to your artwork. Edge-aware painting, another option, automatically detects where paint should stop on an image. The app also features text functionality, complete with strokes, drop shadows, and fades. Some Photoshop Touch selection tools. The application makes it easy to obtain raw material. 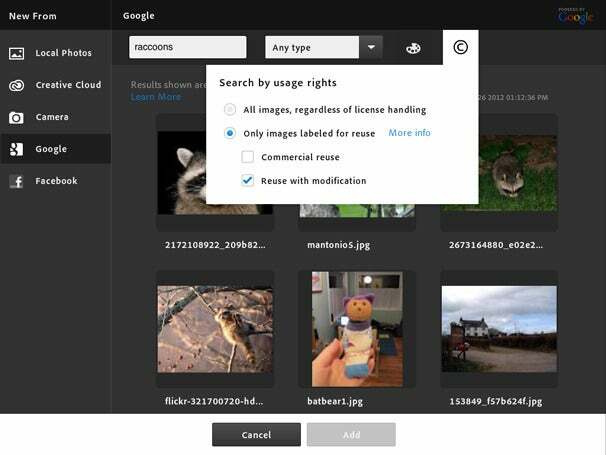 You can choose images from various sources such as your camera roll, shooting your own image from the iPad, and from online sources such as Facebook and Google. With the Google search, you can even search by color. For the design crowd, the app makes it possible to search for images that are properly licensed for reuse and modification. Firing up Photoshop Touch does not leave you wondering what to do next. Within the app, there are a number of tutorials that walk you step-by-step through getting started with major features. If you're a Photoshop user, you'll get the picture pretty quickly. While the main menu is icon driven, a tap will reveal what and where everything is. Eventually, Photoshop Touch will operate in conjunction with Creative Cloud when that service gets up and running this summer. Meantime, you can still use the app as you would any other app on the iPad and email, post, or sync your creation with your Mac for further tweaking. 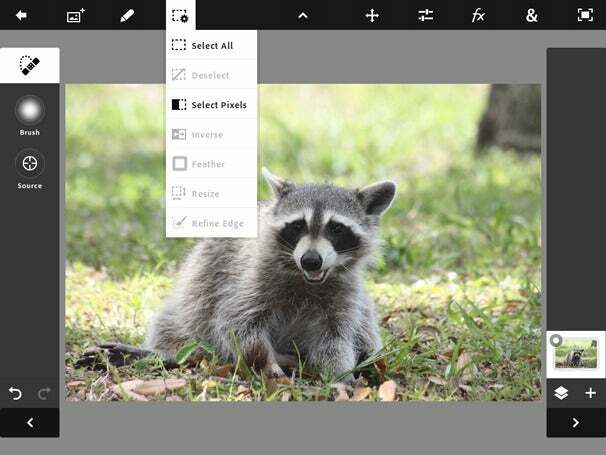 The Google search function within Photoshop Touch lets you choose specific parameters. Regarding the rest of the Touch apps—Adobe Collage for moodboards; Adobe Debut for presenting and reviewing creative work; Adobe Kuler for colors; and Adobe Proto for website and mobile app prototyping—the company has not given exact release dates for their debut on the iPad, but says only that they will be available in the coming months. Adobe Photoshop Touch is available now in the iTunes Store in English in 123 countries. Adobe's website has more information on Photoshop Touch and its other Touch apps. More information is also available on Adobe's Facebook and Twitter pages, from the Photoshop Blog, and on the company's instructional TV channel.